A rear-impact collision (often called a rear-end accident) is one of the most common automobile collisions in Georgia and typically involves two vehicles. This type of collision occurs when a vehicle collides into the rear of the vehicle directly in front of it. This type of collision can occur on highways, public roads, city streets and private property (e.g. parking lots). A rear-end collision usually arises from two alternative mechanisms: acceleration and deceleration. In an acceleration rear-end collision, the car that is following behind the first vehicle accelerates or speeds up and crashes into the rear of the first vehicle. This can occur due to a motorist’s sudden acceleration from leaving an intersection or leaving a stopped position. Additionally, motorists who are inattentive to traffic conditions due to use of a cell phone (whether speaking or texting) and who collide into the rear of other vehicles are typically the result of acceleration. In a deceleration rear-impact crash, the car in front decelerates its speed and the following vehicle collides into the rear of the vehicle in front due to lack of time or poor condition to adequately brake. Of the two mechanisms, deceleration is probably the most common. Deceleration impacts can occur as the front vehicle suddenly brakes, slows for traffic or stops to make a lawful turn. In either situation, the motorist that collided into the rear of another vehicle is liable for following too closely. Georgia law, O.C.G.A. 40-6-49(a) provides that “[t]he driver of a motor vehicle shall not follow another vehicle more closely than is reasonable and prudent, having due regard for the speed of such vehicles and the traffic upon and the condition of the highway.” Thus, a Georgia motorist has a duty to maintain a diligent lookout ahead at all times when operating a car and may never assume that the road ahead is clear of any and all traffic. 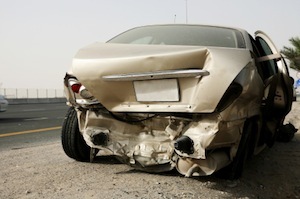 Injuries can often occur from rear-end wrecks. A common injury is whiplash. Whiplash is a non-medical term for injuries to the spine (neck and back) that are caused by sudden forward and backward stretching of the spinal muscles (ligaments). In a rear-end impact, the motorist’s body is thrown forward and back in quick succession due to the force from the impact of the car. The symptoms of a whiplash injury may include pain, swelling, and aching of the neck and back. In these types of wrecks, it is important to seek medical treatment and possibly a magnetic resonance image (MRI) of the spine to determine whether the crash has caused a herniation, disc bulge or fracture. Due to legal liability of the motorist that caused this impact, it is important to seek legal advice from a seasoned car accident attorney to determine your options under the law. To quickly determine your rights under the law, please contact an experienced personal injury attorney. The Law Offices of Kevin C. Ford has been handling rear-end collisions and other vehicle collisions for nearly 20 years.